The Expo Blog is a space for posts on the history, themes, legacies and experience of Expos. It includes articles from the BIE and external contributors. 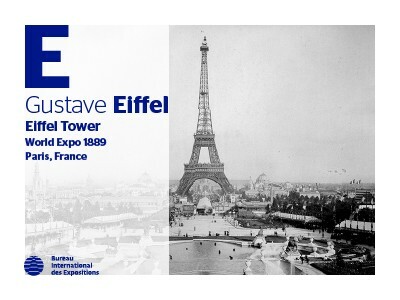 His most famous creation having just turned 130 years old, it is only natural that Gustave Eiffel occupies the “E” spot in the Expo Architecture series. Undoubtedly the most recognisable and the tallest Expo structure ever created, the Eiffel Tower – built for World Expo 1889 Paris – is not only an icon for Paris and France, it is also a symbol for World Expos. The idea behind the Tower was first floated by Expo Organisers, who wanted a 300-metre tall welcome tower to greet visitors to the event which celebrated the 100th anniversary of the French revolution. Among 107 proposals submitted, it was Gustave Eiffel’s innovative wrought-iron lattice design, developed by engineers Maurice Koechlin and Émile Nouguier, that was finally selected. The structure’s final design was concluded after contributions by architect Stephen Sauvestre, who added the iconic arches to its base. Unique structures are one of the highlights of World Expos, and it is often among the national pavilions that some of the most striking buildings can be found. 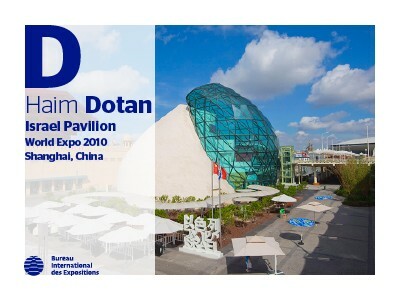 Such is the case for Haim Dotan’s curvilinear pavilion, designed for Israel at Expo 2010 Shanghai, which takes the “D” spot in the Expo Architecture series. Renowned for his cutting-edge styles and techniques, Israeli-American architect, urban designer and poet Haim Z. Dotan designed the 1,200m2 pavilion with the theme “Innovation for Better Life”, responding to the Expo theme, “Better City, Better Life”. Among the creations of Santiago Calatrava, more than one have been designed for Expos. 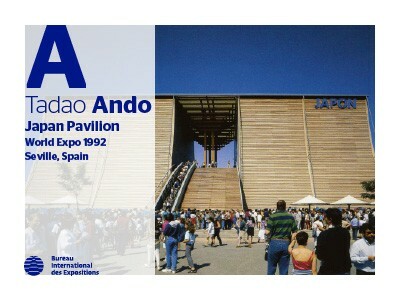 Already in 1992, the Spanish architect and structural designer created the iconic Puente del Alamillo and Kuwait's unique pavilion for World Expo 1992 Seville. A treat will also be in store at World Expo 2020 Dubai, where Calatrava has designed the host country’s 15,000m2 falcon-inspired national pavilion, currently under construction. But the "C" selection in the Expo Architects series opts for undoubtely one of the most visited of Calatrava's creations: the grandiose Gare do Oriente railway station, opened as the main entrance hub for Specialised Expo 1998 in Lisbon. Following on from Tadao Ando, the A to Z of Expo Architects continues with another Japanese Pritzker laureate: Shigeru Ban. 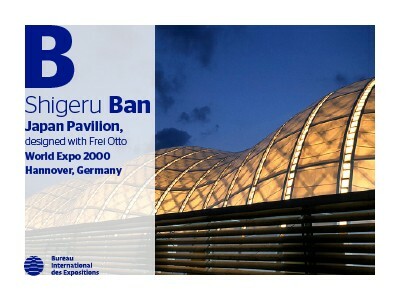 A pioneer in the development of temporary buildings for disaster victims, Ban teamed up with Frei Otto to create a unique pavilion for Japan at World Expo 2000 Hannover: one of the world’s largest paper-tube structures. As more and more countries reveal their pavilion designs for Expo 2020 Dubai, a look back at architectural creations from past Expos offers many inspirational and intriguing designs. With thousands of architects having shaped the history of structures and the built environment by designing bold pavilions, structures and sites for Expos, it is impossible to sufficiently highlight them all. Instead, each week will see a new post for each letter of the alphabet, offering a snapshot of 26 selected figures in the world of architecture.